Bay parking manoeuvre is only conducted within the (relatively controlled) grounds of the test centre. 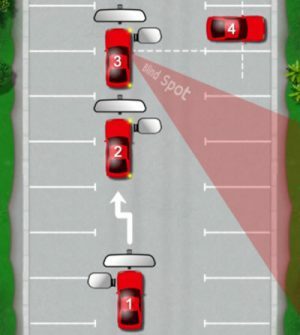 One of the more significant aspects of the forward bay park is that it is to be undertaken in much more public locations such as hotel and supermarket car parks.Anyone with any experience of reversing out of a bay at a supermarket will tell you that a drivers observational skills are highly tested here. 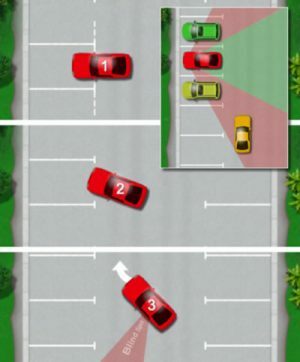 Many pedestrians have little regard for a reversing vehicle and will assume that you see them as they walk directly behind your moving vehicle. 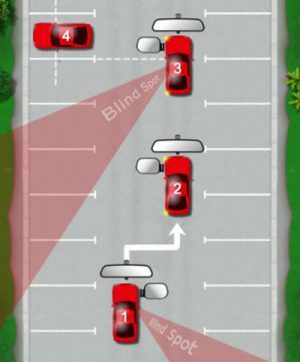 Children being difficult to see may be running erratically around you, stray shopping trolleys, impatient drivers shooting past as you’re reversing, other drivers reversing out of their bay at the same time as you – the list goes on. What The Examiner Is Looking For! Forward Bay Parking To The Right! Forward Bay Parking To The Left! Reversing Out Of The Bay!